Tubbing and siphons might not be the sexiest equipment of the homebrewing kit, but there are a few things that you should know about them. Tubing:There’s a few times during the home brew process when you’re going to need to transfer your beer as delicately as possible. The first time is if you’re moving you’re wort from a primary fermenter to a secondary fermenter like a carboy. The other times happen on the bottling day. You’ll need to transfer the beer from fermenter to the bottling bucket and then from the bottling bucket to the beer bottles. 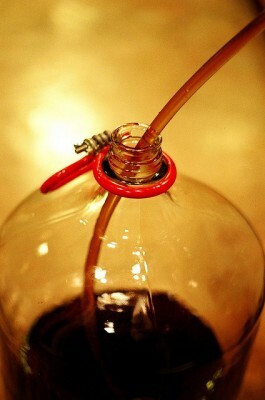 Siphons: To get the wort moving through the tube, you’re going to need to siphon it some how. You could do it the way criminals like steal gas, creating suction with their mouths…but who knows how much bacteria and germs that would get into your wort. I have a feeling that could turn out bad. However, a lot of home brew shows sell auto-siphons that attach directly to your tubes. It’s a lot easier than using your mouth and not too mention a lot more sanitary. Make sure that you get a tube and siphon that aren’t the same size. It can get a little slippery and sticky, so it doesn’t hurt to get a tube that is 7/16″ and a siphon that is 1/2′ so they fit together easily. I also recommend cutting the edge of the tube diagonally, doesn’t have to be big, but it will make it easier to slide the two pieces togeter. And that’s the exciting world of tubing and siphoning. Okay, maybe not exciting but they will make your life a whole lot easier and your beer taste better.